For me there was something intriguing in the idea of an “ethical vampire novel.” It implies -- no states -- a moral superiority. Were other vampire novels unethical, then? Or even antithetical ? And would the book, as the publisher promised, “encourage readers to re-examine the idea of vampirism and to consider the social, environmental and spiritual issues of immortality”? I knew I’d have to answer these questions for myself and there was only one way: I grabbed a copy of The Season of Risks (Simon & Schuster), dove in and didn’t look back. And so, for me, the truth was quick to uncover: after a very short time reading, whatever was initially meant by “ethical vampire” didn’t matter. 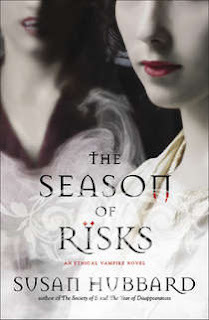 The Season of Risks is stylish, sensuous and poetic. The language lilts and the story flows. If there were ethical battles being waged, I didn’t notice them: at least, not any more than one usually does when fiction of this nature is unfolding. This territory is both fraught and well worn. Adding something new to the oeuvre and unusual and perhaps not truly to be expected. Or even, when one thinks of it, strictly necessary. What do you want when you pick up a book like this? Entertainment, perhaps escape. The Season of Risks delivers profoundly on both counts. What else matters? Ariella Montero is a classic fish out of water. As a hybrid half human, half vampire, even she doesn’t understand all of the things she is capable of or all of what her parentage might mean. The season of risks began with the summer of love. That was my name for it: a time of strong feelings that changed quickly, from bliss, to embarrassment, to anxiety.